New Zealand is a country with 15 unique geographical regions and diverse natural beauty ranging from its lakes, rivers, native rugged bush, the majestic volcanoes of the North Island's central plateau, featuring the North Island skifields of Whakapapa and Turoa to the mountain peaks of the majestic Southern Alps, fiords of Milford and Doubtful Sounds, the great southern lakes, awesome national parks with native rugged alpine bush landscapes and glaciers of the central and west coast of the South Island to the major South Island skifields of Mt Hutt, Queenstown and Wanaka that can be experienced travelling on a national network of long distance and inter-regional bus, coach, scenic coach services and inter-island ferry services. InterCity Coachlines is the largest national regional and long distance bus and coach network in New Zealand, operating a fleet of modern environmentally friendly buses and coaches to 500 communities within New Zealand, with over 130 daily services - 365 days a year with a range of affordable fares and bus passes to suit all travel needs. 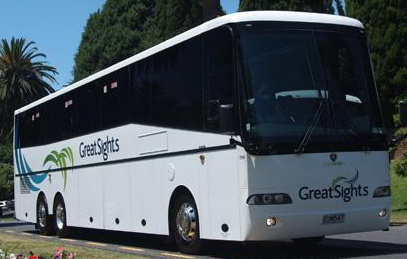 Great Sights operates a nationwide network of luxury scenic coach and sightseeing services, to key visitor destinations in New Zealand including Paihia (Bay of Islands), Waitomo Caves, Rotorua, Christchurch, Tekapo, Mount Cook, Queenstown, Milford Sound, Wanaka, Fox Glacier, Franz Josef and Greymouth. Travel in modern coaches that have fully equipped with air conditioning, reclining seats with head and foot rests, washroom facilities, onboard video and multi-lingual commentary (Japanese, Mandarin and Spanish on selected tours). Travelling on the TranzAlpine train is a scenic rail journey from Christchurch to Arthurs Pass and Greymouth passing though the Southern Alps from one coast of New Zealand's South Island to the other. From your carriage you’ll see the fields of the Canterbury Plains and farmland, followed by the spectacular gorges, ascending up river valleys of the Waimakariri River of the Southern Alps to the alpine village of Arthurs Pass for a short break before descending to the West Coast of New Zealand's South Island, through lush alpine beech rain forests to Greymouth, where there are connecting scenic bus services to other destinations on the west coast of New Zealand's South Island including Franz Josef and Fox Glaciers, Hokitika, Punakaiki, Westport and Nelson plus scenic coach services to Wanaka and Queenstown. To explore New Zealand's scenic beauty, there is a range of flexible 'Book As You Go' bus, scenic coach, ferry and sightseeing passes allowing you to travel at your own pace, in any direction, at any time on the national bus and coach networks of InterCity Coachlines, Great Sights and Cook Strait ferry services between the North and South Islands giving you value for money travel. After a day's travel, choose from a range of backpacker hostels to motels, motor inns, apartment and hotel accommodation that are close to regional and long distance bus, coach, scenic coach and sightseeing services stops or terminals, for a comfortable night's stay.